I'm going to visit my grandfather and run errands today, so I thought I would post one of Mother Humble's recipes to tide folks over. ... and because Mother Humble has been hounding me to post her sticky buns since Christmas. She even provided me with the recipe and her own photos. She must be really proud about winning that dueling potato roll contest. I believe this dish is commonly called monkey bread, but around here we call just them Mom's sticky rolls. Growing up, it paid to get up early when Mother Humble was making her sticky rolls. The best rolls are always on the outside of the ring, thoroughly coated in syrup and coveted bits of caramelized sugar. The base uses Mother Humble's potato roll dough, which can be found here: Dueling Potato Rolls. It won't require a full batch of the dough, generally we make rolls for dinner and reserve 1/3-1/2 of the dough for sticky rolls the next morning. Make potato rolls. Grease a tube pan with non-stick spray. Roll approximately 27 balls of dough, roughly 2 inches in diameter. Place a layer of 9 rolls into the pan. Sprinkle with cinnamon and whole pecans then pour in a third of the caramel syrup. Repeat with 2nd layer of rolls and more cinnamon and caramel syrup. Repeat with 3rd layer. (Can be made without the nuts)." "Bake at 350 for 25 minutes. When rolls are done, invert onto serving platter and serve warm." This is nice sweetie. I've now written you back into my will. I would have like to have been there when this came out of the oven! Lovely. I now know what to do with all the neglected egg yolks that end up in the trash. That just makes you want to reach out and grab it!! Haha! I love MotherHumble's comment! I seriously enjoy your blog. And Mother Humble I don't blame you for nagging, those look absolutely divine! Oh My GAWD. Those look SO yummy. Wow. SOO good. I just drooled a little, on my shirt. I lost my recipe for caramel sticky rolls, and I think I found my replacement. Yum! your mom is hilarious - and from the looks of it a sinfully wonderful baker! 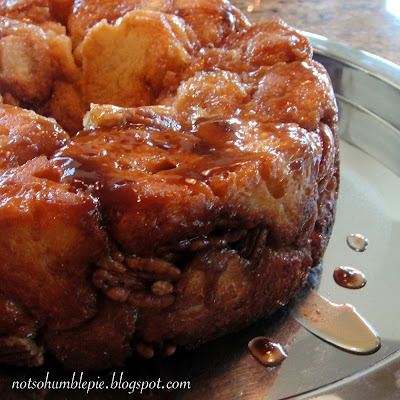 THanks for the post, been looking for a great recipe for monkey bread on christmas mornings - trying this one next year! I just adore these buns, probably my favorite breakfast pastry! And I even love more that you made "MOMS"! I just posted my Mom's cheesecake recipe on my blog and I think we need to keep our family recipes alive! Thank you for this one..Mom! I made 2 batches of this wonderful recipe this morning. One with nuts for the adults and one without for the kids. It was a huge hit. I heard words such as "heavenly" and "hey mom, you should make this EVERY morning for breakfast". It was delicious and beautiful. Thanks Ms. Humble and of course to the talented Mother Humble too. I could seriously go for one of these this morning!! I think I have decided what I will make this weekend for a special treat!